Amy Stolzenbach‘s formal music education began at age five on piano in Columbus Ohio, but her parents would tell you that she was singing and imitating music that she heard by the time she was three. As the oldest of two, she didn’t have an older sibling to turn her on to new music so her parents’ record collection of music like Carpenters, 5th Dimension and other vocal groups of the era were her mainstay until she started borrowing records from the local library and making mixtapes of favorite songs from the radio. This started her obsession with understanding how all of these sounds she was hearing fit together. She began teaching herself guitar at age ten by learning songs like Cecelia by Simon and Garfunkel then quickly moved on to Stairway to Heaven. Hearing Back in Black for the first time changed everything. She told her mom that she wanted to be a rock star. 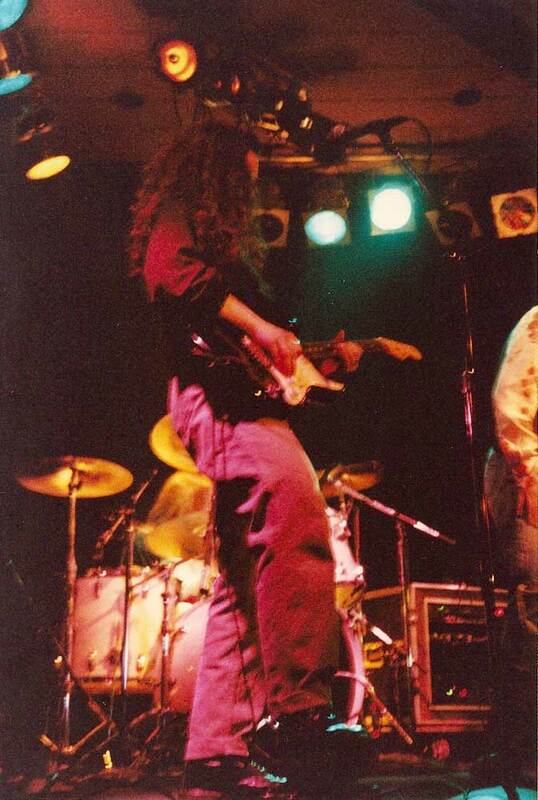 High school rock bands, her first pro gig in bars six nights a week at 19, moving to L.A. in 1989 for guitar school at 20 all led up to moving to Seattle in 1991. This vibrant community was like nothing she had experienced yet was everything she dreamed of. She plugged in quickly joining Charlotte’s Webb. Shortly after that she formed her own band flood in 1993. Writing songs with Kim Virant in 1999 lead to a stint in her band, but she was always just a little under the radar….until the hurricane named Hell’s Belles hit Seattle in 2001. Fueled by Amy’s love of AC/DC, the idea for the band actually came to her one day at work at American Music in 1998 – an all female AC/DC tribute band with a schoolgirl Angus. They tore the roof off of many a venue in the western US and Canada. Suddenly Amy was on everyone’s radar. After a couple of years there was a need for less drama and more time for writing so she made the tough decision to leave her own band. She was swooped up by Carrie Akre and co-wrote the opening track on her second album and played in her band for two years. By 2005 the music biz started to wear on Amy so she followed her heart and released a solo album in 2007 where she was songwriter, engineer, producer and played all the instruments. In 2010 she went back to school to learn orchestration and film scoring techniques. Since then she has been working steadily composing music for indie films and other visual media.